From the Jr line Ueno Station, Central exit, or the Okachimachi station, north exit it is a 2-minute walk to the shopping district. Ameyoko market (アメ横商店街) is 400 yards long and has nearly 400 shops. It is visited every day by 50,000 people seeking fresh fish and crab. That number reaches 100,000 people during the weekend. It is a spectacle of Ueno, especially at the end of the year. Ameyoko bargaining tables attract a lively crowd of people that makes it a fun place to be for locals as well as tourists. 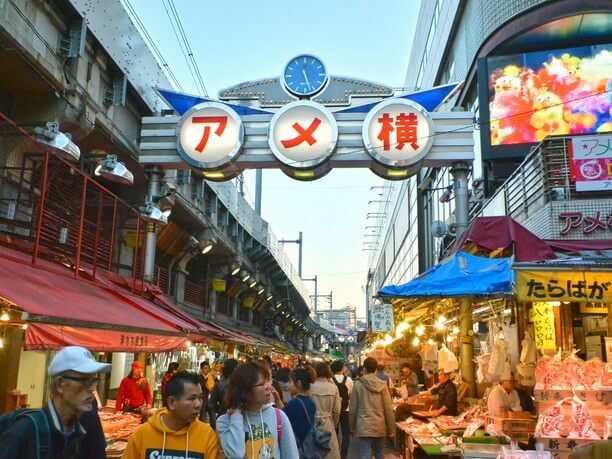 Ameyoko is a place where bargaining is commonplace! 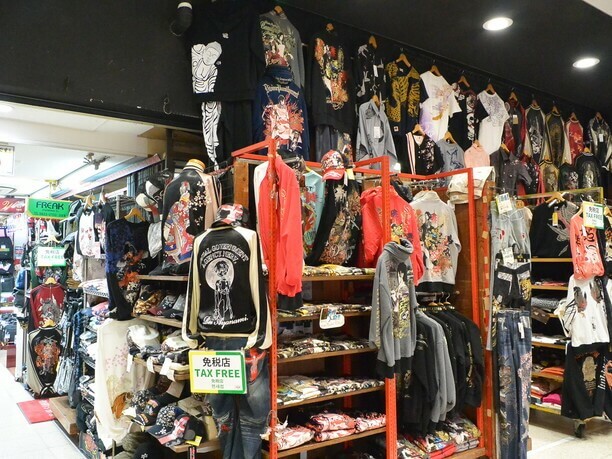 The motto at Ameyoko is “by good stuff cheap! 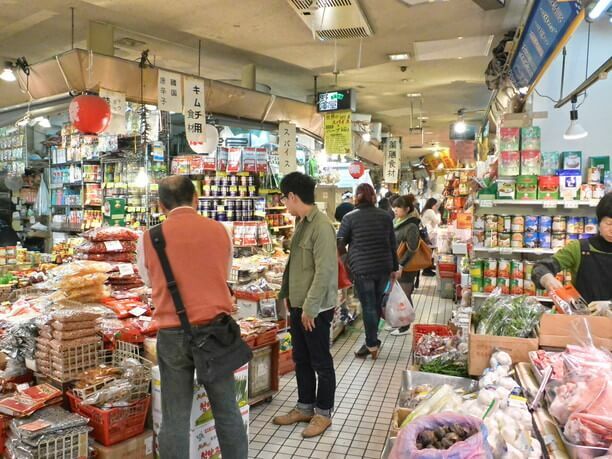 ” Typically, Japanese are not known for their ability to haggle over the price of something. Which sometimes puts them at a disadvantage when they travel abroad where haggling is more commonplace. 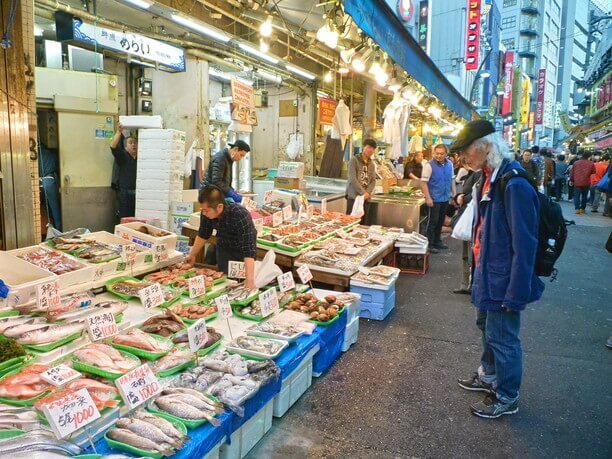 Ameyoko is a place where they can practice haggling over the price of things like fresh fish, snow crab and king crab. Especially over bargains at the end of the year. So, it is not only the good food that attracts people to Ameyoko, it is also the fun of haggling to get the food cheaper. Stop and eat when you want to take a break! 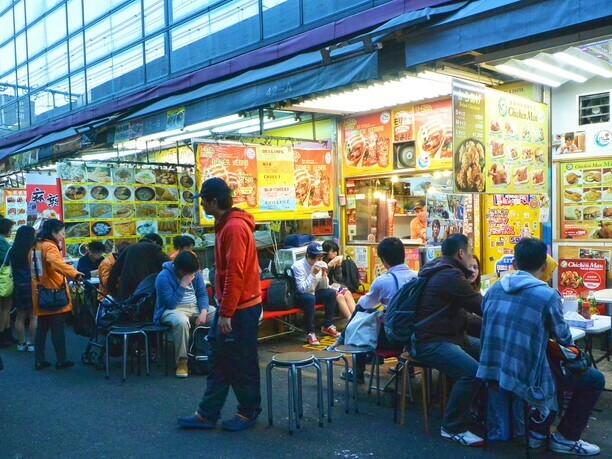 While shopping at Ameyoko you might become hungry or just need to take a rest. If so we recommend stopping and getting something to eat. Popular spots are the “Hyakken” (where you can get side dishes of fresh cut fruit), “Kebab Moses’s” (specializing in all types of meat on skewers), “Danke” (for butter blend coffee and cake), and Saiko Shun Shanhai Shouronpou Ameyoao branch (where you can enjoy good Chinese food). “American Corner” was a fun place to shop! Ameyoko got its name as a result of the fact that many shops in the area were selling supplies to American troops in the vicinity of Ueno after the Korean war in 1950. The area was called “American Corner” (shortened to Ameyoko). It was known for having many clothing and accessories stores and other military goods for sale. It was also famous for having limited brands of American sneakers and lots of candy! In the case of using public transportation. 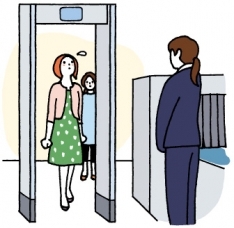 ・From JR Ueno Station Central exit it is a 10-minute walk. By taxi it approximately a 10-minute ride and costs 660 to 730 yen. 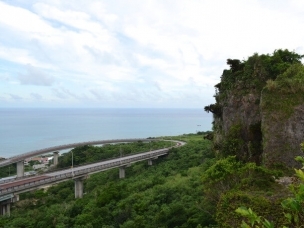 ・From JR Okachimachi Station North exit it is a 16-minute walk. By taxi it is approximately a 10-minute ride and costs 660 to 730 yen. ・From the Tokyo Metro Hibiya line and the Ginza line Ueno station, exit 5b it is a 10-minute walk. By taxi it is approximately a 10-minute ride and costs 660 to 730 yen. ・From Tokyo Metro Hibiya and the Valley line Naka-okachimachi-Cho station, exit A2/A5/A7 it is a 15-minute walk. By taxi it is approximately a 10-minute ride and costs 660 to 730 yen. ・From the Tokyo Metro Ginza line Ueno Hirokoji station, exit A2/A5/A7 it is an 18-minute walk. By taxi it is approximately a 10-minute ride and costs 660 to 730 yen. ・From the Toei Subway Oedo Line Ueno Okachimachi town station, exit A7 it is a 17-minute walk. 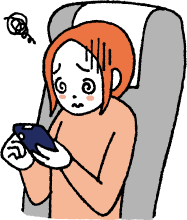 By taxi it is approximately a 10-minute ride and costs 660 to 730 yen. 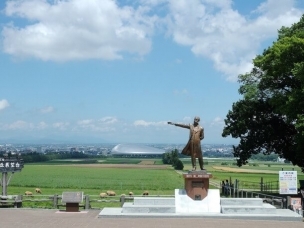 The “Takamori Saigo” statue of Ueno was erected to praise Saigo’s bloodless war at the Edo Castle.